Ryan Clauson just emailed me to let me know that he has chopped the price of his Listen Act Attract audio program in HALF! If you are unfamiliar with Ryan Clauson he is a college student who has spent his last five years approaching thousands of women. He decided to create an audio program geared toward college students to teach them what he learned the hard way. The program is called “Listen Act Attract” and is over 2 hours long. It is an audio guide for how to attract women in your college and elsewhere. Two hours of audio alone is a great deal for less than $30… but that isn’t all!!! The first is “Facebook Attraction”. 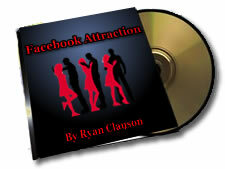 It is a complete audio guide on the best ways to attract women by using Facebook. The last bonus is a free 30 minute phone consultation with Ryan to address your particular situation and give you the solutions you’re looking for. But you need to act now because the price is guaranteed to go back up sometime soon so click here to order Listen Act Attract NOW!